So this will definitely not be a fast build, but I want to keep myself motivated and having a build thread is a huge step. This truck was my Grandfather's. I was given it when I was ~15, and it has so far just hopped from one Uncle's garage to another. I thought when I bought a house 7 years ago I'd have room to work on it finally, but it wasn't until this year when I built a bigger shop that I have finally gotten the truck into a building I own with my tools it in (just happened today in fact)!. 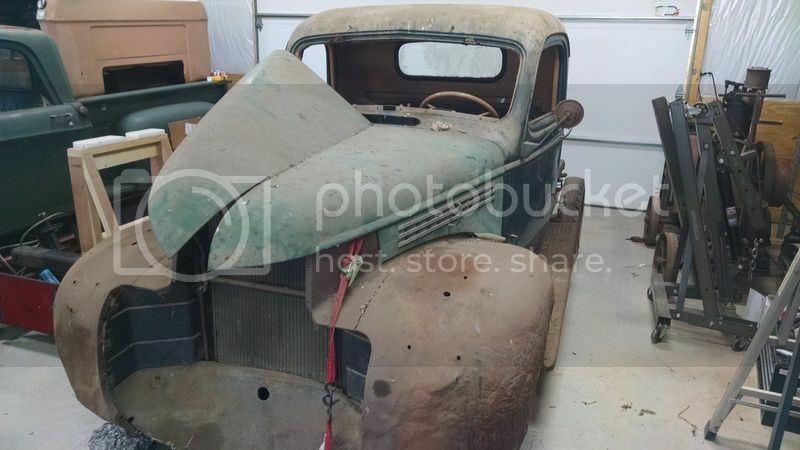 If I was picking a truck to start a build from I'd have picked one in better shape, but it's my Grandfather's and it has to be brought back. My Grandfather bought this truck sometime in the late 50's. It had been a parts truck at the Pontiac dealership he worked at for many years (he was there for 34 years when he retired). The truck came to the farm where it was used hard until it quit, then it was parked. My uncle took a shot at restoring it in the late 70's and gave up and parked it in the barn. 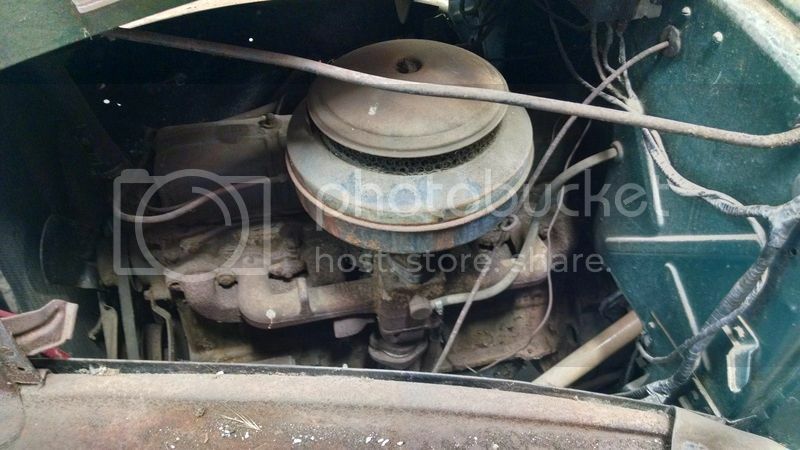 He rebuilt the engine, but it's seized again, and the bed was already beyond repair when he started so it got scrapped. The end result is in the pictures below. Although I haven't been able to work on the truck I have been collecting parts for a decade and a half. 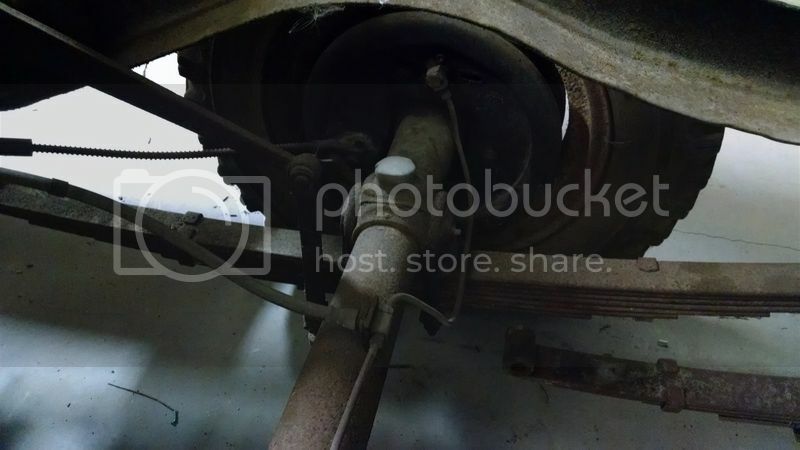 The front fenders are shot, but I've scrounged up some really clean steel replacements. The 216 in the truck is shot (and it's a 216) so I got a '54 235 from a powerglide car; short waterpump, full pressure, hydro lifters. I've also got some motor goodies like an Edmunds 2x2 with Stromberg 97's, custom 235 valve/side cover, Fentons, and a T5 adapter plate. For the truck I've got a '59 front axle to rob of it's better bendix brakes, a '59 rear axle also for the bendix brakes and the open center section, and a cool vintage flatbed for the missing bed. Still missing a decent grille (not sure mine can be saved), and a valence. 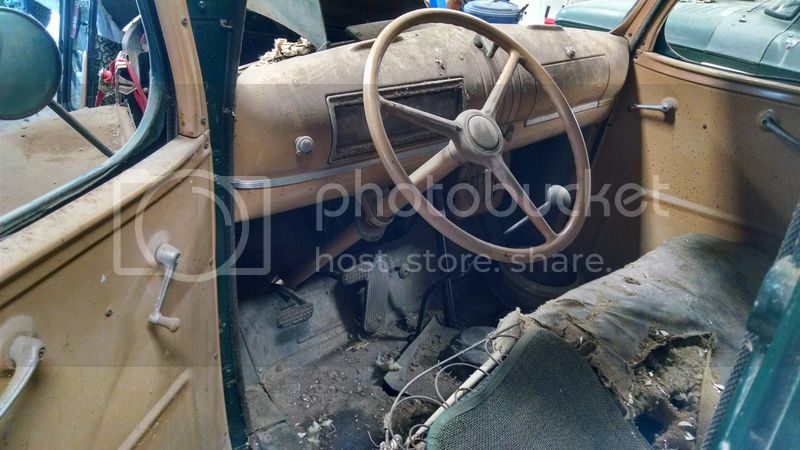 The cab is fairly solid, but there's some rot at the windshield hinges, the brakes are stuck along with most everything that should move (but the windows in the doors roll up and down!). Also, my uncle said he thought he patched the cab with some fiberglass somewhere, but I can't find it with a magnet so it's either really small or he's mis-remembering the truck's history. 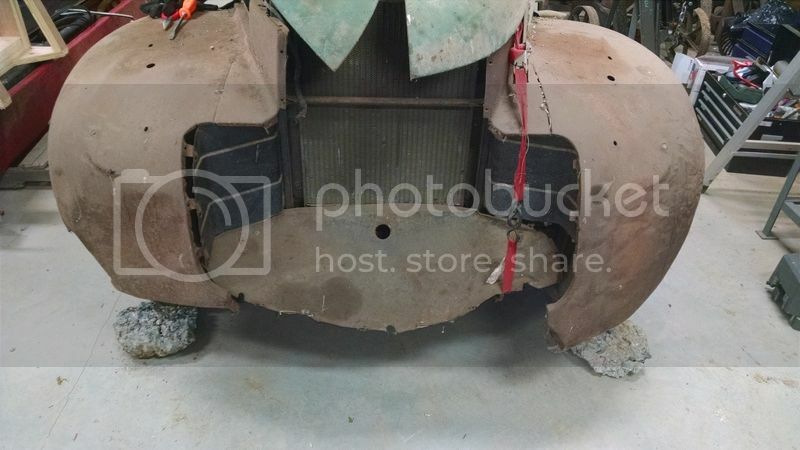 So I've gotta fix the rot, settle for sure on a drivetrain (still torn on 235 vs 283), figure out the replacement bed, source the missing body parts, and then of course paint/wiring/interior/etc. I want the truck to be clean, usable, and fairly period-correct (although I'll lose a couple points for the T5 if anyone actually crawls underneath). I know the flatbed will also be pretty tough to pull off 'right' but I'm gonna go for it. I need to find a new cab trim piece at the top of the windshield (seen below). What's the right name for this panel? 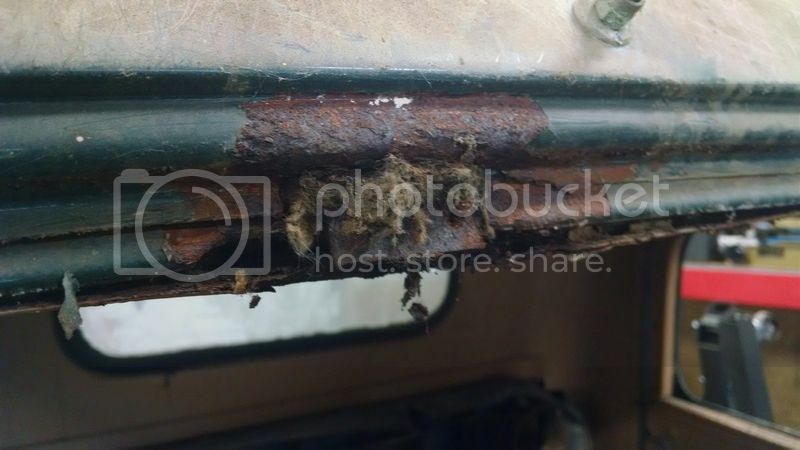 Passenger side windshield hinge. Not sure what the deal is with the fiberglass packing? Both hinges have it coming out above the hinge from inside the cab. Couldn't pull it out from the outside, I guess it's packed in behind that trim panel above that rotted. It seems to have held some moisture and cause the worst of the cab rot I've found (so far). So that's just to get myself motivated. I hope to really get into this project this fall/winter, but I know I won't be having weekly good solid updates. There will be questions, and mistakes I'm sure. That's a nice worthy project. Thanks for the pictures. Cool truck, you'll enjoy bringing it back. Mice tend to fill that portion of the body with stuff. Probably where the fiberglass came from? Hey John. Looks like our trucks are in about the same condition right now. I'm going with the "slow but steady" approach on my '41. I'm not too far from you...near Brunswick, MD. If you need a hand, give me a shout. I don't know a lot, but I'm good at moral support! Good luck! Cool truck and an even better history. Best of luck with your project. I certainly hope you better success than your various uncles! 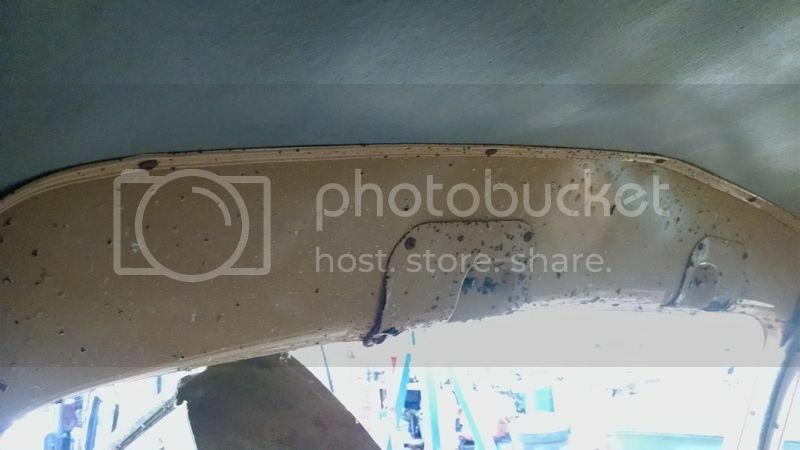 The insulation your are seeing up around the windshield hinges behind the header panel is most likely the seat padding. Mice think that area is the most wonderful location for a penthouse condominium complete with bathroom facilities. Much of the corrosion up there is from their urine. Unfortunately GM body design engineers made it possible for vermin to gain unimpeded access the header panel via the a-pillar. Worse yet, the rodents can get into the header panel area in a completely tight and assembled cab. 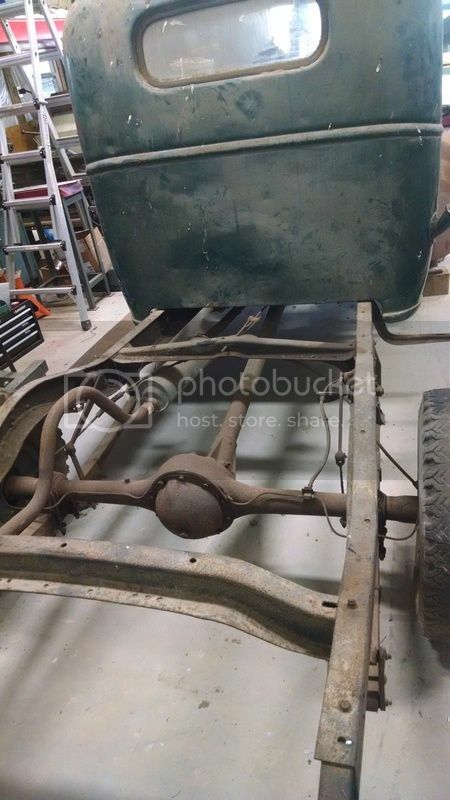 When you get the floor and toe boards out look at the front cab mount area and you we see what I am talking about. When I restored my truck, I focused on all original, but this was one rare exception. I formed a couple of barriers to keep those little buggers out. As from the factory, notice that any creature can get into the door c-channel perfectly protected. Not a ton to report from this week. Stripped off the roached fenders. The inner fender panels were very nice. All the braces are still there. I have a beautiful set of stock/steel fenders waiting for this truck I picked up a couple years ago (coming in a post soon). Couldn't get the header panel removed, all the screws stripped. I'm going to have to drill them (and there are a lot). 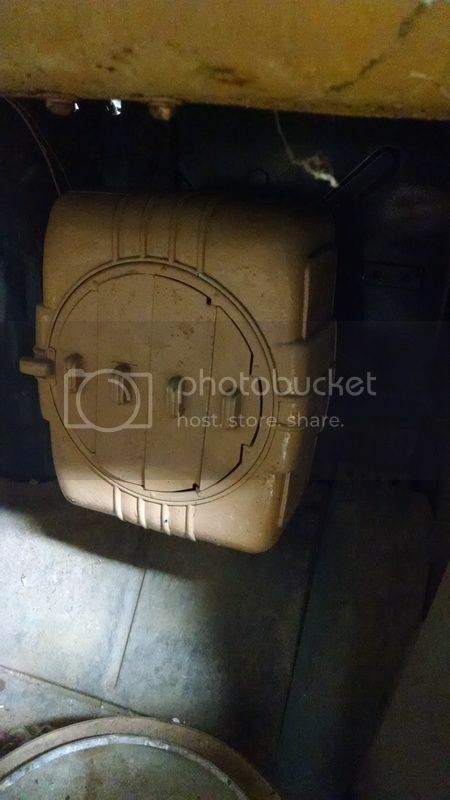 In the mean time, can anyone ID the heater in my truck? Supposedly my Grandfather installed it out of some other car he had at the time? 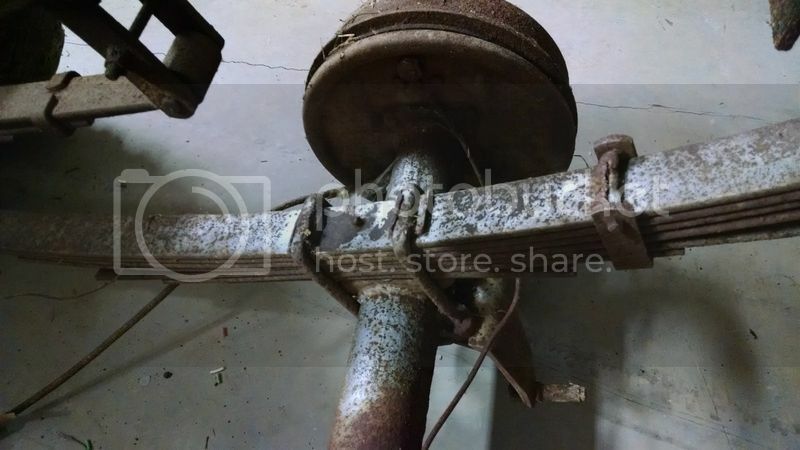 a) Cut the mounts off the '59 axle and weld on the mounts from the '46 axle. 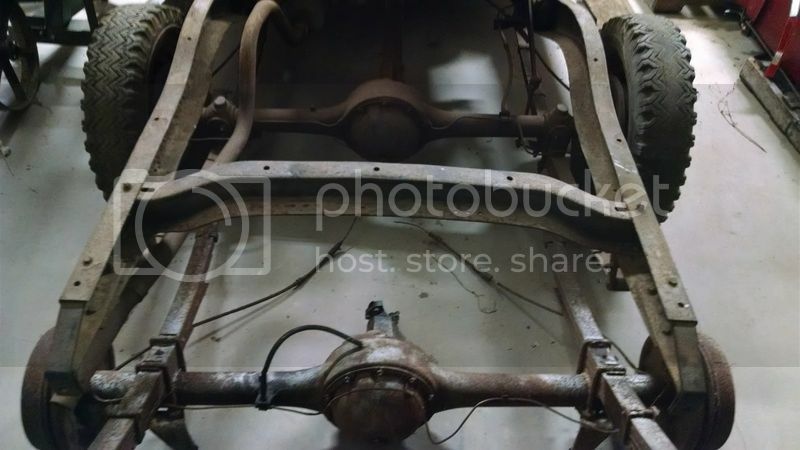 b) Swap the center-section and backing plates from the '59 axle onto the '46, and then weld the existing mounts solid on the '46 axle. Personally I think I prefer option b). 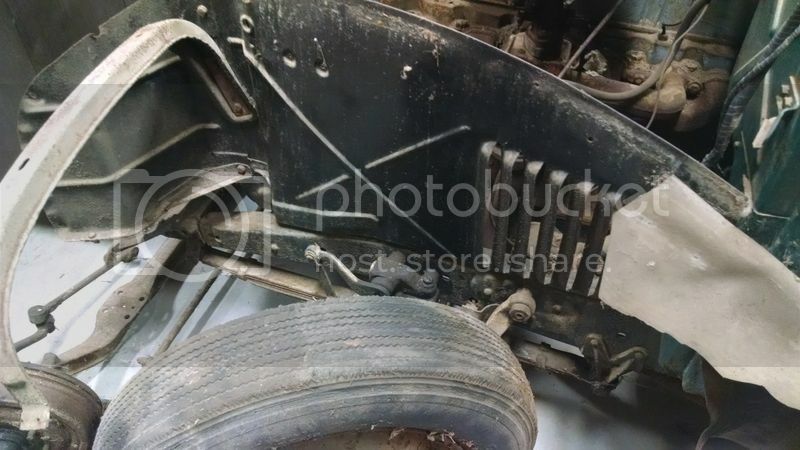 Has anyone swapped later backing plates onto the earlier '46 axle? They look to be the same bolt pattern, but the '46 has 13" brakes and the '59 has 11" brakes. The '46 also has the backing plates offset inboard farther than the '59. Still looks like it should work, but right now both axle are soaking before I start trying to break loose the various bolts and fasteners. I finished my 46 last year. I took lots of pictures so if you need to figure something out take a look at my photobucket. Sometimes when you can,t get those clutch head screws out you can grind a slot in the head and use a straight blade screwdriver. Have fun. Mine took 4 years. That is a great truck and story. When I first looked at your thread I opened the pictures to see what you were working with. First thing I saw was the front fenders. I immediately thought of the movie Heartbreak Ridge. They may not kill you but they'll definitely break your heart trying to get them right. Then I saw that you have good replacements and had to chuckle. Anyway, your plan sounds good. If I had to provide one opinion, I'd say go with the 235 over the 283. A straight six is in that truck's soul. Very cool to own one that's been in the family a long while. Thanks for sharing (the story and the picks) with us.